Ballinderry will come to a standstill on Sunday as they bid farewell to footballer Aaron Devlin who passed away on Thursday. In a statement, the club said thousands had visited the Devlin family home to pay their respects to the popular 23-year-old. “The impact Aaron has made in his short life has been made even more evident by the thousands of people from all over Ireland who have made their way to his home over the past two days. 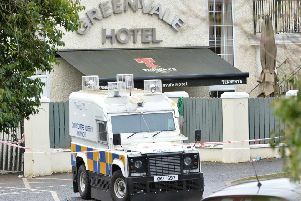 “Aaron will be laid to rest after 12-00 noon mass at St. Patrick’s Church Ballinderry. Any club member who wishes to part of the club’s guard of honour should make their way to Shamrock Park for 11-30 am. they should wear club colours. “It has to be noted that our chapel will not hold the numbers anticipated to be attending the funeral but the funeral mass will be relayed to a large screen outside . “Also, the carpark will not be able to contain all the vehicles expected to be there and we urge mourners to please use the alternative car parking facilities which will be made available.